As months have turned into weeks, and the weeks have turned into hours the tension, nerves and excitement have only become more intense in the lead up to the ashes. Despite Australia showing some signs that they have the ability to challenge England in the summer, overall the series win was relatively comfortable for the home side, winning 3-0 to ensure they retained the ashes yet again. As an England fan, any England victory, particularly in an ashes series, is something to savour, but I couldn’t help get the feeling after the five matches we hadn’t seen the best of what England had to offer. Moments of brilliance were book ended with relatively average cricket, from both teams. Players out of form, combined with slow pitches, resulted in ordinary test cricket. The five tests didn’t ignite the passion of the previous ashes series. The rivalry was still present but because the English were clear favourites, Australia just couldn’t keep up. The simple answer to why England didn’t play there best cricket is because they didn’t have to. This time against Australia however, they will need to perform. 50lb shoulder muscles. Pieterson, on the other hand, is the loose cannon in the side. He can be awful at times, attempting to dominate the bowlers before getting himself set, only to dolly up an easy catch. But as always with KP, he can put on a show, cart the ball all round the park and win a game in an hour. 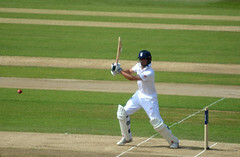 He’s the one player in England’s ranks that can up the run rate, an area of England’s game that is often criticized. He breaks the mould for an English cricketer, this is somewhat helped by the fact he’s not English but that’s another matter entirely. We've all seen our fair share of Ian Bell this summer to know that there’s no doubt that he’ll contribute heavily with the bat, in the rich vein of form he has found himself in. From an experienced campaigner to an exciting youngster. Joe Root’s first taste of ashes cricket resulted in him having a peculiar series, with just the one big score of 180 in amongst a pattern of failures. Root now has an excellent chance to cement his place within the England side, whether it be at number six, the position he’s likely to bat in the first match, or as an opener, if he returns to that position. If he can become more assertive on the front foot, he could be winning many more ashes series in the future. After a quite frankly dismal summer, following the best year of his career to date, Matt Prior’s form is entirely unpredictable for this forthcoming ashes series. Despite his form, if there’s one batsmen that can dig England out of a hole, it’s Matty P. Undoubtedly the tail will be called upon to provide some extra runs. Broad and Swann usually relish the challenge but I feel that without the likes of Bresnan, the tail can’t be relied on too heavily in all of the five games. Swann, Broad, Anderson, three names that we all know lots about and have been the mainstay of the England attack since the 2009 ashes. Swann, as always, will be a threat to the Aussie batters, especially with the bounce the Australian wickets will provide for him. The bounce will also benefit the tall bowlers, a breed of bowler that is by no means a rarity in England’s squad. Broad, Rankin, Finn and Tremlett should all enjoy bowling on the quick bouncy tracks Australia has to offer but the lack of variety in the bowling attack may cause problems for captain Cook. It doesn’t appears as if the selectors can choose between Finn, Rankin and Tremlett, all similar bowlers, all with similar attributes, so why pick all three? Surely Graham Onions would have added something different, making the attack more versatile. When compared to the Australian team, the England side look stronger. There’s no doubt that the Aussies have quality players, capable of putting England under pressure. Watson, Rogers, Smith, Haddin all have runs in them and when put into an order alongside Michael Clarke they do look threatening. The bowling attack is also promising. Harris the stand out, supported with the likes of Siddle, Johnson, Faulkner and the spin of Nathan Lyon. Despite the obvious threat to England, I seriously doubt the whole team can perform consistently throughout the series. Test match cricket requires a team to perform for five straight days, with the Australian team these days there’s always a collapse on the cards. To withstand any chance of beating England, Michael Clarke’s role in the side, both as a batsmen and a captain will be vital. If Australia get the plans right against England’s individual batsmen, then the urn may slip from England’s grasp. Meanwhile the England team, as a collective, appear to be in good shape. In the warm up matches most of the batsmen had beneficial time in the middle and the bowlers looked to be in good rhythm. It’s inevitable that injuries will occur at some point during the five matches, potentially playing a significant role if the series goes down to the wire. My one wish for this series is that I hope the action lives up to expectations. This is a lie, I will be content if England win, regardless of the quality.